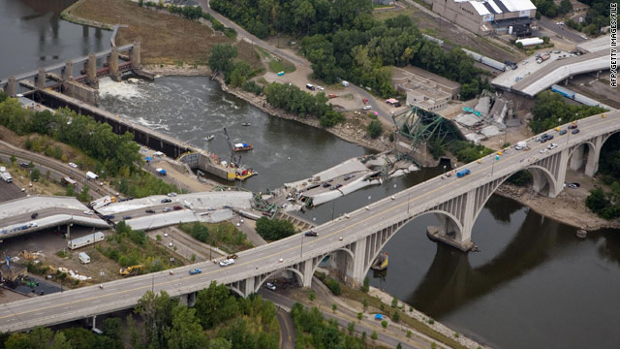 The deadly collapse of a major interstate bridge in Minnesota in 2007 and the explosion of a steam pipe in the middle of New York City soon after brought national attention to the disintegration of infrastructure in the United States. The bridge had been deemed “structurally deficient” years earlier in 1990 (to be joined by some 77,000 other bridges by 2007). The pipe, part of a poorly maintained, century-old system, was either ruptured by an old water main found broken nearby or wore out on its own, breaking the main in the process. 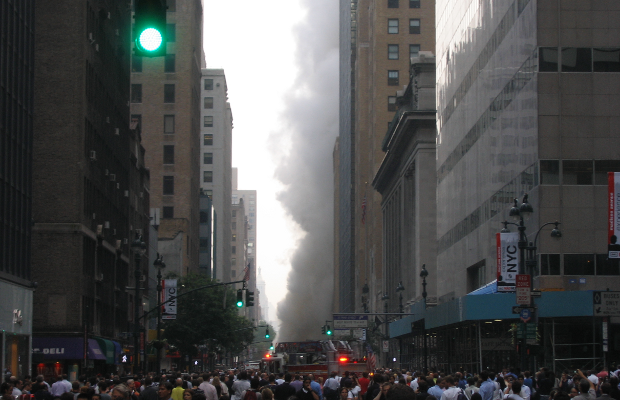 There have been 12 other steam pipe explosions in the city since 1987. The richest country in the world is faced with literal “boom”—in the form of exploding sections of electric, gas and steam systems—and “bust”—in the form of collapsing roads and bridges—on a widespread and regular basis. Pennsylvania, perhaps the state most notorious for poor road conditions, appears to be falling apart at the seams. In June, 2010, a major bridge in West Newton was closed when a cleaning crew noticed “parts of it falling off.” The small town was formerly home to radiator and boiler production facilities. Today it distinguishes itself from ghost towns by maintaining a very small number of shops in its dilapidated center. The story isn’t much different in the major cities. In 2008, the Birmingham Bridge, a major artery in Pittsburgh, was forced closed for weeks after a bridge deck and pier shifted only a year after extended repairs. Tellingly, even when open the bridge has several dead end lanes—evidence of a city belt system project that was abandoned with the majority of the area’s mills. These roads to nowhere perhaps say more than anything written here. According to the the American Society of Civil Engineers, 26 percent of the bridges in the United States are either deficient or obsolete. The Federal Highway Administration has estimated that nearly $80 billion dollars would be needed to bring these bridges up to par, yet the federal government only allocates around $5 billion annually to such work. The long backslide in maintenance and development has come alongside the decline in the country’s manufacturing base. Much of the “essential infrastructure” is simply no longer essential for those seeking profit. And indeed the issues in U.S. infrastructure as a whole are simply a national expression of a global phenomenon. The considerable development of infrastructure across parts of Europe and East Asia in the last six decades is undeniable. Trips through Western Europe and Japan are now measured in minutes thanks to high speed rail, and one can drive across South Korea and back without running into as much as a pothole. To a certain extent this can be attributed to the “start from scratch” required by the mass destruction in these areas during World World II, the vast investments made after in the “post-war boom,” and the need—real or perceived—to move masses of war materiel efficiently during the Cold War standoff. Additionally, we cannot ignore the long-running aims of the U.S. and European powers to build up these countries as models and bulwarks against the Eastern Bloc, China, North Korea, etc., and seek out cheap labor power… There has also been a limited level of development in parts of Africa and the Americas in recent decades. Total investment in infrastructure around the world is in fact quite insufficient—by how much is up for debate. Current infrastructure expenditure in Asia amounts to only around 21 percent of what is actually necessary, and investments in Africa and Latin America fall tens of billions short of what would be required just to meet demand according to many sources. This hardly sounds unrealistic. That capital would actually be able to meet demand is unimaginable, especially in this period of crisis, “correction” and austerity. After all, the existing infrastructure was created in the main to facilitate accumulation in the first place. As capital continues to seek out a path of return to an acceptable rate of profit, we can expect a dramatic increase in social decay. Ultimately, even if capital does not have to pull us into another world war to find a way out of the impasse, the remains of a large part of the existing infrastructure may very well end up looking as if we had been through one anyway. Places like Detroit offer a prelude of what is to come. A healthy and viable mode of production is able not only to replace what is expended, but also to generally reproduce and expand. Today, the global capitalist system is capable of doing neither. The need to reverse the decomposition of the existing products of human labor is directly tied in with the working class’s historic struggle to abolish capital and its destructive forces. The process will require the repair, extension and integration of the infrastructure currently in place on a world scale. This monumental task will be greatly eased by the involvement of billions of people currently excluded from productive work by dint of their situation (imprisoned, in the military or state bureaucracy, burdened with domestic servitude, etc.) or position (working in completely superfluous sectors like advertising, finance, insurance and real estate, as isolated specialists, or not at all) who will be freed up with the overthrow of capital. When generally divided up amongst all, the required labor contribution of each individual will shrink immensely; and the work will be directly rewarding. The need for this is very real. This is not an academic exercise. In the absence of such a thoroughgoing transformation, we will be confronted with an increasing slide toward the depths of a barbarism from which we may never escape.